Black is admittedly an unconventional color choice for a dominant color. Making it work in a bathroom can be extremely tricky, especially one that is cramped or underlit. But when done well, it can look stunning and sophisticated, as evidenced by the selection of black bathrooms featured below. Here you'll find tips for how to work with black in a bath, along with a selection of black paint colors to try in your own space. Look for subtle differences in undertones when selecting a black hue for your bathroom. Some have a warm tinge; others are cooler. My favorite blacks have a little bit of blue or purple — this gives them a cool, clean feel that contrasts nicely with wood tones and warm neutrals. Black-hued walls don't have to make a space feel dark and confining. Take a tip from this elegant bathroom and pick a blue-black for one or two of your bathroom walls. Cool colors recede, so the far wall here feels more distant than it actually is, giving the impression of a larger space. 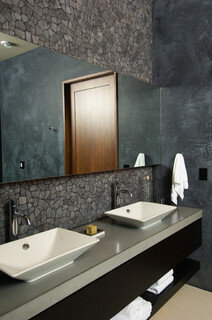 The black wall color also coordinates nicely with the dark veining in the marble. If you decide to go all in and use black on most or all of your bathroom surfaces, think of ways to circulate light so the space isn't too dark. 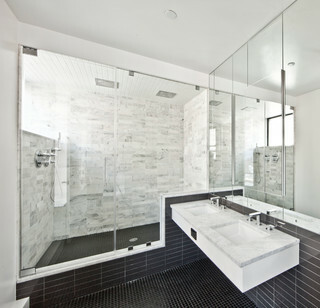 The wide mirror (with its integrated light) and the wall of windows help to lighten things up in this bathroom. The lighter color of the sloped ceiling makes the room feel more open, too. What a fun, fantastic bathroom! It's proof that a black and white palette need not be boring. The wall covering is such a strong visual element in the room that not much else, adornment-wise, is necessary. Play with shades of gray and black for a stylish, debonair space. I like the use of materials and textures here. The bulk of the colors in the space are dark, but because of the variety of materials and textures, it doesn't feel like a black abyss. If a limited palette of black, white and gray feels too cold to you, add some warm wood into the mix. These dark gray and black tiles provide a nice backdrop for the sculptural plumbing fixtures. They really pop out and take center stage. 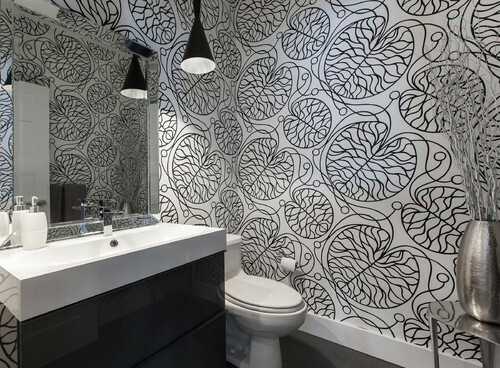 Contemporary Bathroom by Brooklyn Design-build Firms Grant Davis Thompson, INC. If black walls aren't your thing, try putting the hue on your floor. Black absorbs light, so incorporating plenty of reflective surfaces helps to bounce light through the space. 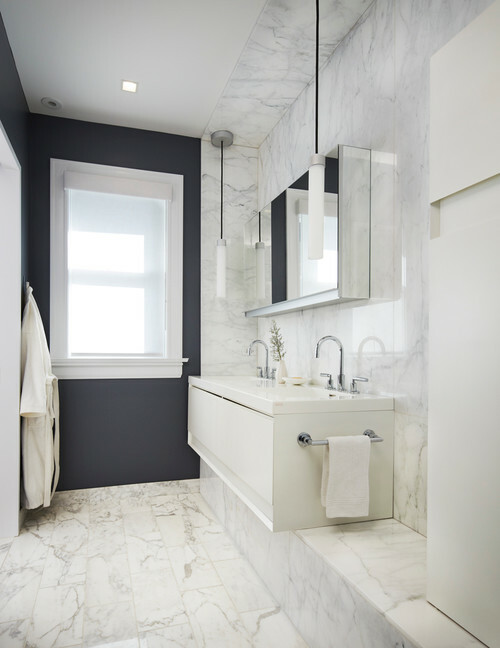 Those fortunate enough to have tall ceilings in their bathroom can easily pull off a palette that includes black without having the space feel cave-like and claustrophobic. This sleek, contemporary bathroom is a knockout with its interesting mix of materials and textures. The black tile on the shower walls has a nice texture and sheen that allow light to bounce and reflect off of it, unlike with a light-absorbing matte black surface. This helps lighten up the space immensely.